In a recent interview, Blizzard talked about the first World of Wacraft Legion patch, Return to Karazhan, and revealed some interesting tidbits. At Gamescom last month, Blizzard announced patch 7.1 for World of Warcraft, in which Karazhan will make its come back as a large 5-man dungeon with all 9 bosses. Blizzard already stated that the ‘Old’ Karazhan will remain as well, and players will still be able to enter the raid and farm for various items. In a recent interview with Tradechat, World of Wacraft’s lead content designer Cory Stockton, lead game designer Luis Barriga, and sr. game designer Eric Maloof provided some additional info on the expansion’s first patch. As already said, the new Karazhan dungeon will contain all 9 bosses, and will almost act like a 5-man raid. The ‘new’ Karazhan will have a week-long lockout, and to enter the dungeon, players will need an attunement. For the attunement, players will fight the Burning Legion alongside Khadgar in a quest that picks up after the pre-Legion ‘Hiding in the Stacks’ quest. 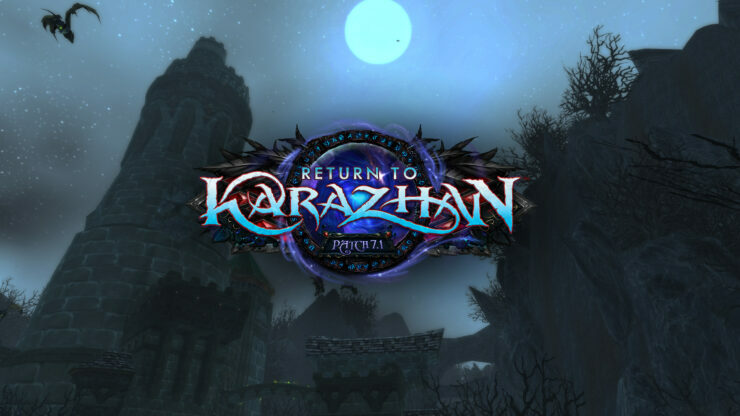 The original Karazhan raid from The Burning Crusade expansion will remain, and a separate side entrance is created for the new Karazhan dungeon. The difficulty level sits a little above mythic mode (highest level of raid difficulty introduced in Warlords of Draenor), and is aimed to provide players with an upgrade path. Since an attunement is needed to enter the dungeon, players won’t be able to enter Karazhan right away, but raids won’t be necessary to get good gear either. At the moment of writing, there are no mount drops yet in the new Karazhan. Itemization is done late in the Public Test Realm (PTR) however, so more loot could appear during the PTR. The Return to Karazhan 7.1 patch is slated for a release on the PTR anytime soon. World of Warcraft: Legion was released last week, and according to Blizzard, the sixth expansion has pushed player count to its highest in “recent memory”.